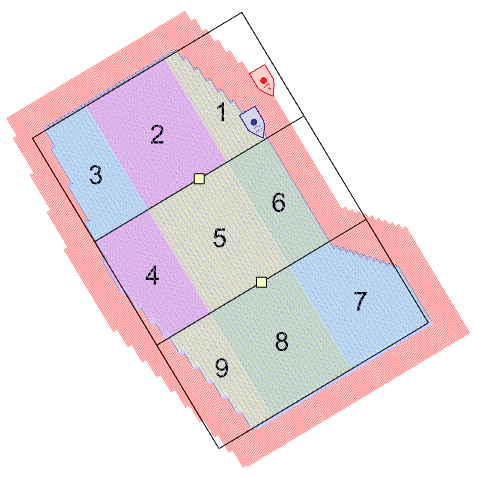 This 2.0 level release is a significant step in moving towards an editor-based application, where constraints and survey parameters are applied in the map, rather than in a centralised Parameters dialog. This transition will allow for more granular and detailed control over survey features. As the 2.x series develops, more features will appear in the map, most commonly accessed by a right-click context menu. The new tiling feature replaces the “Fill receiver bounds crossline, inline” roll type that was previously available in Templates. Any pre-2.0 project files that used this setting will need to be reconfigured to use tiles. To reconfigure an old file simply open it in version 2.0, and configure tiles to replicate the old crossline, inline behaviour. (For instance if the crossline, inline setting used previously divided the survey into four zippers, then set the number of tiles to four.) Apply the changes and save the project. The previous “Fill receiver bounds inline, crossline” roll type is no longer available. This setting was very rarely used, however if you have a project that requires it please let us know. Tiling is a method of slicing a receiver area into rectangular sections (zippers), and acquiring the tiles one at a time. The tiles and any patches within the tiles follow a grid that is aligned with the receiver inline and crossling directions. Tiles can be set and adjusted in the new Tile Configuration dialog, and tile boundaries can also be adjusted by dragging directly in the map. Read more about tiling in the release 2.0 user manual. Rather than rebuilding the survey after every map-based edit, Seafloor Planner now enters an ‘unapplied’ state when edits have been made. The unapplied state means that changes have been made but the survey has not yet been rebuilt to take account of the changes. In the unapplied state, Apply and Cancel buttons will be visible in the top right corner of the map. Make as many changes as are needed, then press the Apply button to rebuild the survey incorporating the changes. Alternately, press the Cancel button to discard changes and return to the previous applied state. Undo and Redo buttons have been added to the toolbar. Up to 10 actions can be undone or redone. A dropdown menu allows multiple actions to be undone or redone at once. Fixed: Rolling spread and source lines pattern surveys not being correctly exported to XPS. Usability changes: Guided Tour Exercise 3 update to include tiles.